You must have seen them before. They look like a usual website but instead of taking you to a different page, its navigation labels take you to a different section on the same page. You may be tempted to get one of those because you want it simple. Plus, you don’t have much info to share. So, the fewer the pages, the less the trouble, right? Nope. There will be SO much more trouble, you have no idea. Here are 4 reasons why a one page website is a bad idea. You may think a one page website is great for user experience. Your visitors can sit back, relax and just scroll. But the truth is, it’s quite the opposite. You know it’s a one-pager. But for your visitors, it looks like a “normal” website (because… navigation). So, they expect it to behave like one. They click on the “Services” label and start reading, but the page doesn’t end with the Services info. It continues with About section or whatever you put next. Which may be relevant info per se but causes confusion here, as it contradicts your visitors’ expectations. You may think it’s not a big deal. Life isn’t always what you expect after all. But every time your website doesn’t behave the way your visitors expect it create a friction in their user experience. Bad friction that piles up causes frustration. And frustration causes abandoning your website altogether. Ok, you don’t have much to say now. But what if you want to add a new service or start blogging? Are you ready to go through major website changes in a year? If you’re not, you may get stuck with copy that doesn’t do you justice. Sure, you can keep adding the information to your homepage, but the longer your page, the fewer visitors will scroll till the end of it. 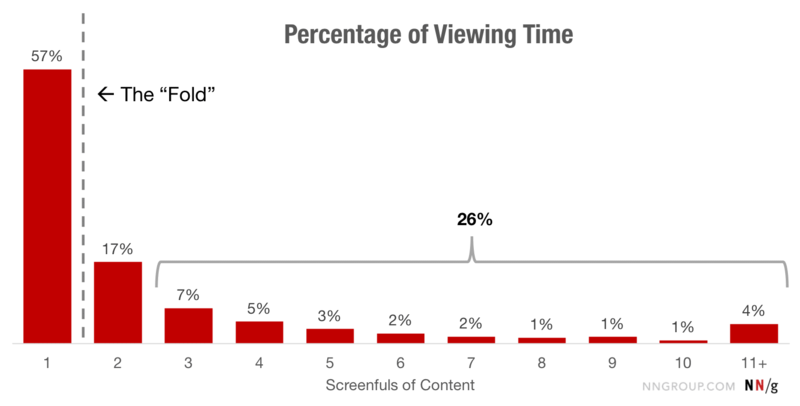 Fun fact: The screen view #1 and #2 receive 2.5 times as much attention as everything your visitors see after they have to scroll 3 times (Source: NNgroup). Your one page website is first of all a page – one URL for all the content. And this content will take longer to load than if you split it between multiple URLs (aka different pages on your website). Especially if your one-pager has a lot of visuals, you’ll be asking your visitors to wait a bit longer for the page to load. How fun! 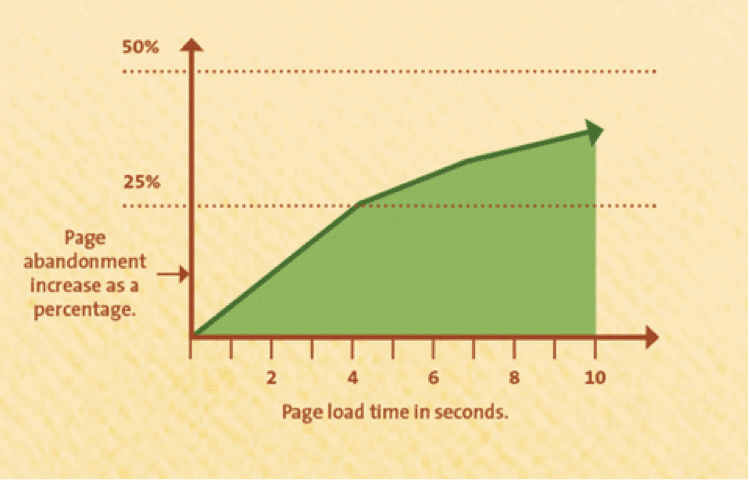 After 4 seconds of load time, 25% of the visitors leave your website (Source: KissMetrics). Google Analytics won’t automatically record which navigation labels your website visitors click as those labels don’t lead to separate pages. Sure, you could configure events in your Google Tag Manager for those stats to show up, but if you feel even slightly intimidated by Google Analytics, Google Tag Manager will make you cry. But even if you’re tech savvy, there is no way to get any data for single page websites that’s comparable to time on page and bounce rate on multi-page websites. So, you’ll have no idea what parts of your page your users are most interested in, how much time they spend reading each part, or how many sections per session your prospects visit. Which means, unless you created a perfect website from scratch (haha), you won’t know what works and what doesn’t, and, thus, won’t be able to improve it. It’s about 1 000 000 times more difficult to rank with one page than with many, especially in a saturated niche. Unless you’re the first person to invent something really cool, like a teleportation device. But even then the Google love won’t last long. Soon, other websites will jump on that keyword wagon and flood the internet with their takes on “10 things you didn’t know you could do with a teleportation device” and “He programmed his teleportation device while sleepwalking. You won’t believe what happened next”. They can do it because they have multi-page websites. And you, dear owner of a single page, won’t be able to keep up. “But my web designer said one page websites are ‘in’. Plus, all the cool kids are doing it”. First, I’d strongly recommend running away from a web designer who thinks something being “in” is a valid argument in favor of a web design decision. ✔️ Your prospects expect that (i.e. it’s a prototypical feature that, if missing, will cause mistrust or confusion). …or delights them without getting in the way of the 3 points from above. ✔️ If you don’t have that thing, your website will appear old, cluttered, untrustworthy, or it will put it in a negative light in some other way. Oh right, cool kids using one page websites. Even if you see other single page websites in your niche, the reasons their owners decided to do that may not apply to you. They may be so cool and famous, they really don’t care. They use their website as a business card, get business through word of mouth / referrals and couldn’t care less about appealing to strangers or getting found in search. They have no idea what they are doing either. To get or not to get a one page website, that is the question. Luckily, it has fairly simple answers. You don’t care about being found in search and use your website as a business card for the visitors who find their way there through the word of mouth. You need a website asap, don’t have more that 3 screenfuls to say at the moment anyways, but you’re aware of its limitations and are planing to convert it into a multi-pager later. You have a very focused offer and are planing to use your one-page website as a “landing page with in-page navigation”. You want to rank organically in search at some point. You are planing to blog. You have a lot of explaining and persuading to do to get your visitors to convert because you offer many things or your offer is complex. 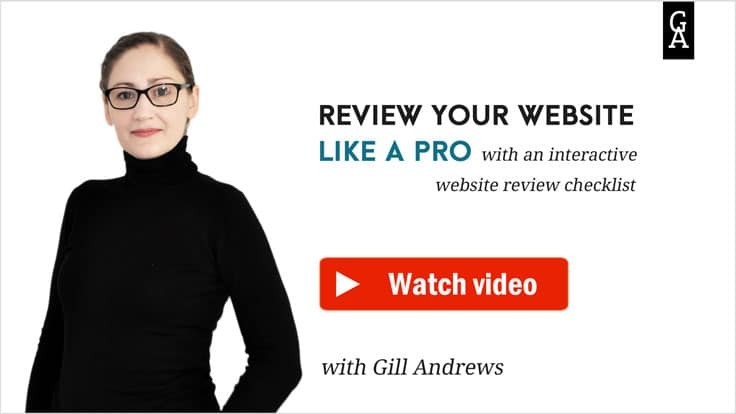 You want to know how your visitors interact with your website to be able to improve it.